Take a look inside their inspiring careers. Photographed by Praise Santos for The Assembly; Courtesy of Almila Kakinc-Dodd; Courtesy of Ellie Burrows Gluck. If you haven't noticed, wellness has emerged as a major buzz word over the last few years. But it is so much more than a trendy topic. It is a subject that encompasses all things that contribute to your health and well-being. It could mean strengthening your body, nourishing your mind, and interacting with the world around you. Everyone has a relationship to wellness, yet some people go further to not only deepen it within their own lives, but to help others do so too. In the spirit of our Clean Slate month, we took the time to chat with three fascinating women who have done just that. While on their own wellness journeys, they realized how their unique experiences and knowledge could be cultivated to improve the world around them. Since, each woman has formed a career that empowers others with knowledge and practices of health and self-care. Between their amazing backgrounds and inspiring work, these three ladies have shown us the importance of wellness, what the word actually means, and why its so important to dedicate yourself to something you are truly passionate about. Read ahead to hear their inspiring stories. Photographed by Praise Santos for The Assembly; Designed by Briana Gagnier. Nkechi Njaka is an incredible woman with a passion for wellness. As a educator and advocate, she works with clients and her community to bring meditation, health awareness, and creativity into their lives. 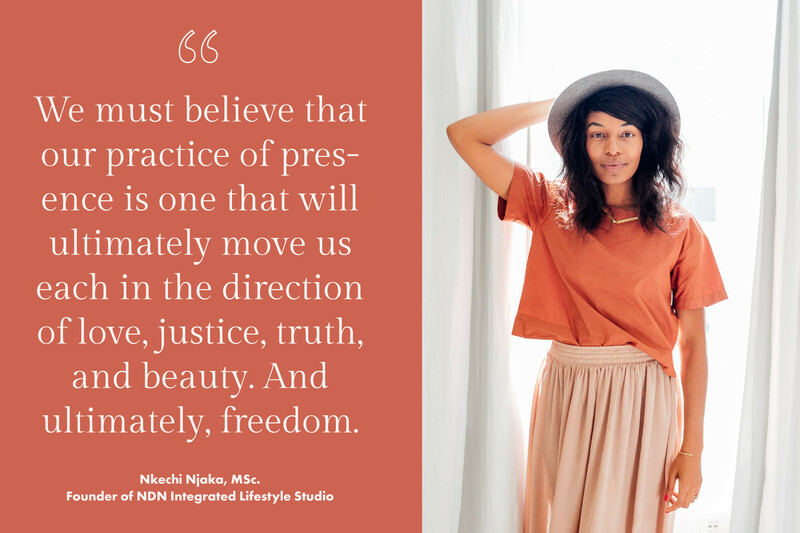 She runs NDN Integrated Lifestyle Studio, a mindful and creative agency based in San Francisco. Nkechi Njaka: Wellness is to be well with the self, with love, with connection, with purpose, with meaning, and with confidence. Being well is a "present moment" process and holistic experience — joy in eating, laughter with close ones, awareness of self, appreciation and allowance of the self, curiosity in movement, playfulness, and connection with others. The reality is that when we are not connected to ourselves, we cannot be in significant, meaningful, or present-moment relationships with others or our communities. When we start to see ourselves, our relationships, and our environment as they are, we increase our capacity to be with more, to hold more, and to transform. We must believe that our practice of presence is one that will ultimately move us each in the direction of love, justice, truth, and beauty. And ultimately, freedom. How did you first actively start to incorporate wellness into your life? NN: It is hard to say exactly when wellness was first incorporated into my life. I was a competitive runner and a dancer growing up so there has always been awareness on my health as it pertained to performing well and being active and feeling comfortable and great in my body. I spent the majority of my life being curious about the brain-body connection. I had a physical practice for wellness and I wanted to understand brain, so I studied neuroscience and dance in college. Neuroscience was my path to working in mental health and meditation which lead me working in science, clinical research, and healthcare. Post grad school, I started having some health-related issues and so I started working with a health coach. That was what inspired my adult health journey. Do you have any practices to encourage wellness in your home? NN: One of the home practices I recommend is meditation. It can be a challenging habit to cultivate, so I make it easy for myself. I do it right when I wake up! I think it’s important to make my home wellness accessible so I have my meditation cushion out so I can see it and be reminded to practice everyday. So much of my home is designed to support my wellness practices. For example, I don’t have a TV or a couch in my one-bedroom apartment. This may seem really extreme and I suppose it is! The space it creates for me is more about movement and less sedentary activity — more reading, more creation, and less screen time. What made you decide you wanted to pursue wellness as a career? NN: I have spent the majority of my life investigating the connection between the brain and the body. I am continually interested in how to apply such a significant relationship for improved health and wellness. In high school, I began a long and challenging relationship with my own mental health and wellness when I started getting panic attacks. I had my first of many episodes of depression, and I was deeply aware of how my anxiety was negatively affecting my physical body, my ability to be present, and the quality of my life. I arrived to college very interested in understanding how fear and anxiety prevented me from living a fully expressed life in certain circumstances, while simultaneously knowing that participatory arts, like my lifelong pursuit of dance, gave me the freedom for self expression. My Scripps College education allowed and encouraged me to truly pursue my interests in the body and the brain; I majored in neuroscience and minored in dance. I built the necessary foundation required for me to further my investigation, and I and went on to complete an MSc. in neuroscience at the University of Edinburgh. As I began to understand through work, research, and personal exploration, I also started to heal. I longed for a deeper connection to my mind and body and longed for this to be in balance for all people everywhere, so I found a way to make this my work. I now live in San Francisco, guide groups and individuals in meditation, and am a somatic and wellness educator and advocate. I also run a small creative agency where I curate mindful and creative content for lifestyle brands. What is it like to see the impact of your business on other people’s lives? NN: It is pretty incredible to see a shift in people when they become more aware and have a better understanding of who they are and what they need and what they value. My work really addresses the whole entire self and I’m always so inspired by the tenacity, ambition, courage, and devotion my clients have towards being better— in whatever way that means for them. Courtesy of Ellie Burrows Gluck; Designed by Briana Gagnier. 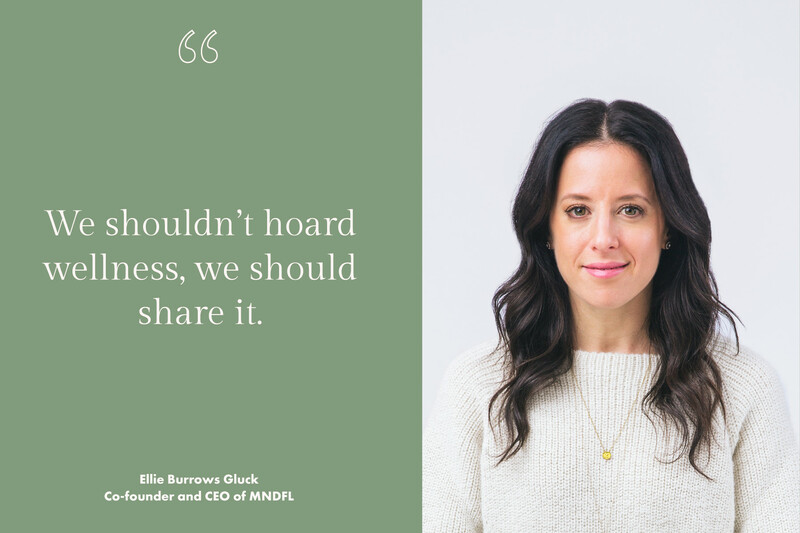 Ellie Burrows Gluck is a film exec turned founder of MNDFL, the popular New York-based meditation studios. She not only runs the fast-growing company, but also teaches classes as well. Ellie Burrows Gluck: The Global Wellness Institute defines Wellness as “the active pursuit of activities choices and lifestyles that lead to a state of holistic health.” I think it’s important to acknowledge that the ability to pursue activities, choices, and lifestyles that lead to health is a privilege and luxury in and of itself. Depending on your resources and access, wellness can look completely different given its context. For one person, it could mean affordable fresh fruit and vegetables and health care, while to someone else it could be a week-long retreat at The Ranch in Malibu and acupuncture every week. Having a perspective around this is crucial if we’re going to use the word in the first place. EBG: My mom was sick while I was growing up and she ultimately passed away when I was 19. One’s wellness was always a focus in my house because the head of our household was unwell. I grew up seeing a woman, who despite her physical limitations, still chose to live her life as healthily as possible. As an adult, I had a health scare in 2008 and made some real changes after that. There were two things I needed to address: my physical body and my emotional one. Diet, sleep, and exercise supported the former and meditation supports the latter. EGB: I try to use non-toxic cleaning products in my house and never run water that I'm not using. I also try to keep a clean home because I feel better when there's order in my home. Additionally, I almost never leave dishes in the sink and I'm crazy about recycling — I aspire to be no waste, but I don't think I will ever be that person. I try to keep healthy snacks in my house in case I want a nibble but I rarely do a big grocery run because I don't want to be wasteful. I try to only buy what will actually be consumed. Because it's NYC, I do have an air filter in my home — sometimes cigarette smoke or other odors waft into the house or there is construction on our street, so I like running it especially when I sleep. Lastly, I grew up in Jewish home and lighting a candle, or fire, often signifies the sanctity of a certain day and marks time. Fire is also often used to sanctify space: it brings me a lot of joy to burn incense or candles in my home when I'm home for an extended period of time. And, of course, lots of plants. They make a home happier and produce oxygen! EBG: I worked in the independent film business for seven years and over the course of that career, I would listen to the way my colleagues would talk about film and realized that the only things I felt equally as passionate about were spirituality and the pursuit of consciousness. I knew I was looking at an unhappy future if I didn’t own that and listen to it. Couple that with the fact that all my free time was spent exploring, studying, and learning about those things, I decided to quit my job in 2013 and travel around the world as a spiritual tourist to pursue mindfulness in a more meaningful way. Not just reading about certain traditions in books but traveling to the seat those traditions and meeting with the custodians of them. When I returned, still unsure of what lay ahead in terms of my career, I enrolled in a New York University program to receive a certificate in personal coaching while picking up a few writing gigs on the side. During that time, I was struggling with my meditation practice and finding it incredibly hard to meditate in my own home. 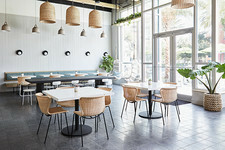 I loved the feeling of group meditation and I personally liked the format of boutique fitness studios — reserving a spot online or dropping in and joining class. I was also volunteering for my co-founder’s non-profit and we had become friends. I approached him because I knew I didn’t have the meditation expertise at the time. I recently completed a 2,000-hour program to become a Vedic Meditation teacher. There’s no turning back now. EGB: To be honest, on more than one occasion someone has shared their MNDFL experience with me at the front desk and I’ve been so moved, I’ve cried. Our community is incredibly kind, diverse, and inclusive — our studio is reflective of the city we live in and as is our teaching staff. MNDFL’s community is made of people who are interested in living life with a more open-heart. They know that the change we wish to see in the world begins with the self. We've received all sorts of feedback from our community members from "MNDFL has helped me become a better father, employer, and human," to "I'm 50 and this place taught me how to finally love myself," to "More than therapy, MNDFL and my meditation practice has helped me with my anxiety. I am so much nicer to my spouse." It inspires me to get up every day and keep doing my job. How does privilege integrate itself into conceptions of wellness? EGB: There are two layers: financial privilege and white privilege. There are people out there trying to survive with little access to clean water, nourishing food, and affordable (and unbiased) health care. Because of the color of my skin, I don't encounter medical racism in the way a someone who has black or brown skin does. I think it’s very easy for us to lose sight of that if we live in a world in which we don't have to be faced with that. It's a financial privilege to be able to afford the following items, which in the context of health should be considered a luxury: a $10 juice, $75 acupuncture session, $65 infrared sauna sweat, $35 spin class, $250 therapy session, and so on. Sophia Roe recently wrote a post on the important distinction between "self-optimization and self-care" in the context of wellness and I think this is brilliant because there is a real difference. Self-optimization might look like a paleo diet while self-care looks like a deep breath or a nap. If you are healthy and have the funds to be able to make optimization a priority, then I would urge you to also share your resources with someone who could benefit from them that isn't you. For example, MNDFL regularly offers free or $10 classes as well as free space to individuals and organizations that are advancing the causes of social justice. And, I regularly donate to individuals and organizations that bring wellness to underserved communities. If we can afford to optimize ourselves day in and day out and support our own physical, mental, and emotional health to the absolute best of our abilities and resources, but we’re not taking our well self out in the world to help make the world a kinder, more equal, place or create meaningful change, then what’s all that effort for? We should be asking ourselves this. We shouldn’t hoard well-being, we should share it because we're all going to meet the same end in the end, you know what I mean? If you need some ideas, email me and I'll be happy to share some resources with you! Courtesy of Almila Kakinc-Dodd; Designed by Briana Gagnier. 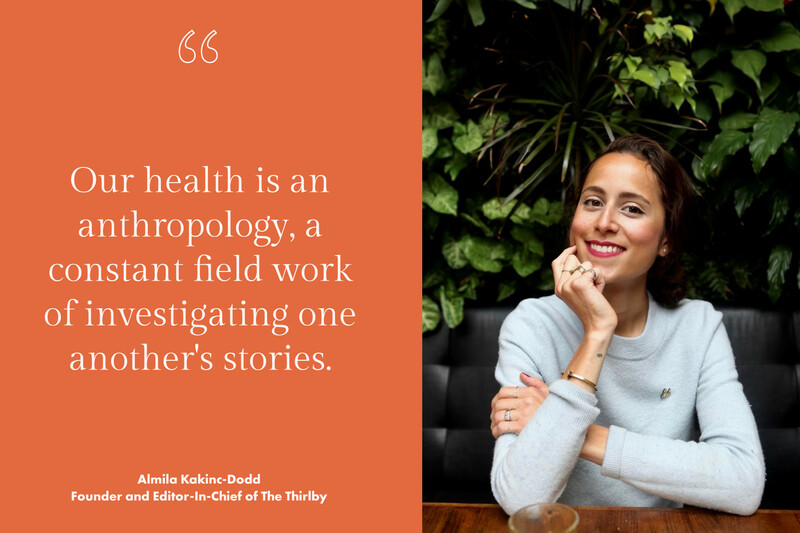 Almila Kakinc-Dodd has created an amazing media platform called The Thirlby, which has a mission to redefine wellness for the common good. She also has written a book filled with inspired advice on natural health, spiritual living, and nutrition. Almila Kakinc-Dodd: I believe that our generation is buying into the wrong idea of wellness. Health has become a way to profit from Millennial FOMO, our generation’s insecurities around our bodies and desirability. We’re promised success through buying trendy wellness products. And the price has become just as costly as high fashion. Fashion can have its highs and lows, but health and thus wellness is our birthright. Wellness is seeing beyond this age, class, and other gaps to make it accessible for all. It’s in education and easy tips, like the ones in my book. AKD: I suffered from a decade-plus struggle with Anorexia nervosa triggered by my traumatic immigration experience at the age of ten. My additional autoimmune diagnoses and eventual recovery from my eating disorder were both catalysts in my passion in exploring, then sharing, wellness. Do you have any practices to encourage wellness within your home? 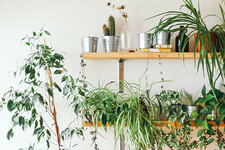 AKD: To me, wellness at home is having trinkets around that, in Marie Kondo’s terms, “spark joy.” It’s important to realize how wellness is beyond the body and includes other people, memories, and our environment. I cultivate that by having old photos of my mother and grandparents, a tune playing on our record player, and burning Japanese incense. AKD: My undergraduate studies in Anthropology opened up my eyes to the culture of Western Biomedicine, its blindspots, and apartheid complex. I narrowed that to the personal level with my Integrative Medicine studies at Duke University, working one-on-one with clients for a few years. I’m now pursuing Nursing at Johns Hopkins University. My aim is to use my background to enrich the wider community through educational resources on The Thirlby and eventually provide direct care to various underserved communities as a clinician, namely in Black maternal health. What is it like to see the impact of your media platform on other people’s lives? AKD: When we are well as a world, we are well as individuals. Our health is an anthropology, a constant field work of investigating one another's stories. That’s why we feature a diverse group of contributors and topics, from Trans health to food resources for furloughed employees affected by the recent government shutdown. I’m humbled that through these stories, we create a community for and with others where we feel well by being heard in our shared human experience.